The UK-based Reeds Carpets are Europe’s top exhibition and event floor covering contractor, installing flooring for major events ranging from the BAFTA Awards to the Ryder Cup. Reeds is also a longtime Lok-Lift customer. We interviewed Martin Cairns, the Commercial Director at Reeds, about why his company keeps coming back to Lok-Lift for its event and exhibition installations. Here are some excerpts from our conversation. “We have a popular conundrum within events and exhibitions where a client may hire a venue such as a hotel, in order to stage an event or product launch. They may not like the decor of the room - they want to change it all. It’s very easy to drape around the outside and hide any unsightly wallpaper, but it’s very difficult to cover up a floor. For example, if there is a hotel with a flowery, overpowering carpet, they may want to generate a flat basic color, or they just want to cover it all black. You can’t successfully lay carpet onto an existing carpet because the top carpet will ultimately creep as the directional pile from carpet beneath compresses under footfall, and the flicks the top carpet when released. We came across Lok-Lift purely by chance. We tested a couple of rolls and noticed that not only would it hold the product in place, it would actually then release away from the actual sub-floor (i.e. the very expensive hotel carpet beneath) without leaving any glue or residue, or causing any damage. “Within exhibitions and events, a lot of people like to have a flat floor. We call it vinyl over here, so it’s a harder floor - something that’s cleanable and moppable for example. When you lay a vinyl PVC product at an exhibition or an event, you really need to glue it down. The product has a linear expansivity, so as it gets warm the product can stretch and ripple. If it shrinks, the joins can pop and then open a gap. Immediately after an installation, the product can look fine. But after 24 hours, the product will have acclimatised and that is when issues become apparent. Manufacturers will stipulate that the product should be fully adhered to a flat, even subfloor for optimum finish and performance. The overriding factor with doing events and exhibitions is that they’re only temporary, so first of all you don’t really want to glue it down because it’s a little bit too over the top for just a few days. 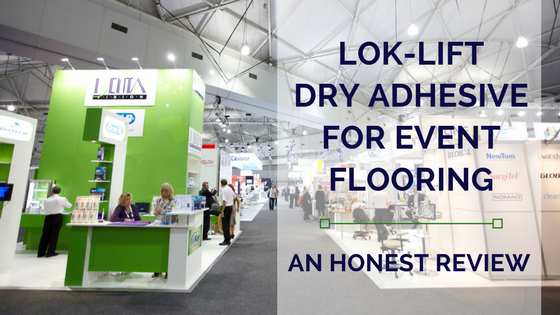 But by using the Lok-Lift product in there, you are getting the same quality as if you glued it down. So when you look at that vinyl the next day, it’s still flat, the joints haven’t popped, it’s been held in place by the lateral strength of the adhesion. It holds the floor-covering firmly in place but will release when lifted, so if you did board out the area, the boards that are preserved could be reused. It’s now at the point where we say, ‘You know, we can actually do this cheaper than the guys down the road because we’re going to use Lok-Lift instead of boards, it’s going to be quicker, it’s going to be cleaner, it’s going to be cheaper.’ And that checks all of the boxes obviously.